Tim Rose and I spent a very enjoyable morning working with these pups to get this shot, you have to work very fast with pups but I have to say they all look like proper little angels don't they! I had a cuddle with all of them and they are bright as buttons and full of character and potential. It's a hard life! Can you spot which one is Juno - this month's cover dog? He's grown a bit, but he's still absolutely gorgeous. 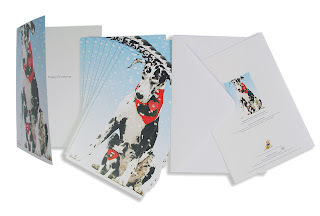 If you'd like to support this new charity why not buy these special Hound for Heroes Christmas cards - £2 from each £5 pack of 10 goes to the charity - which is substantially more than most charity Christmas cards. You can order online via this link or phone the office Monday to Friday 9-5.30 on 01276 858880. These large A5 Cards feature January's cover fantastic stars Bonnie and Boris. And the photo was again the best dog photographer in the world Tim Rose with a little bit of help from Kevin Brockbank. What a team! I didn't see the paper, but so glad you have put this up or I would have missed it. 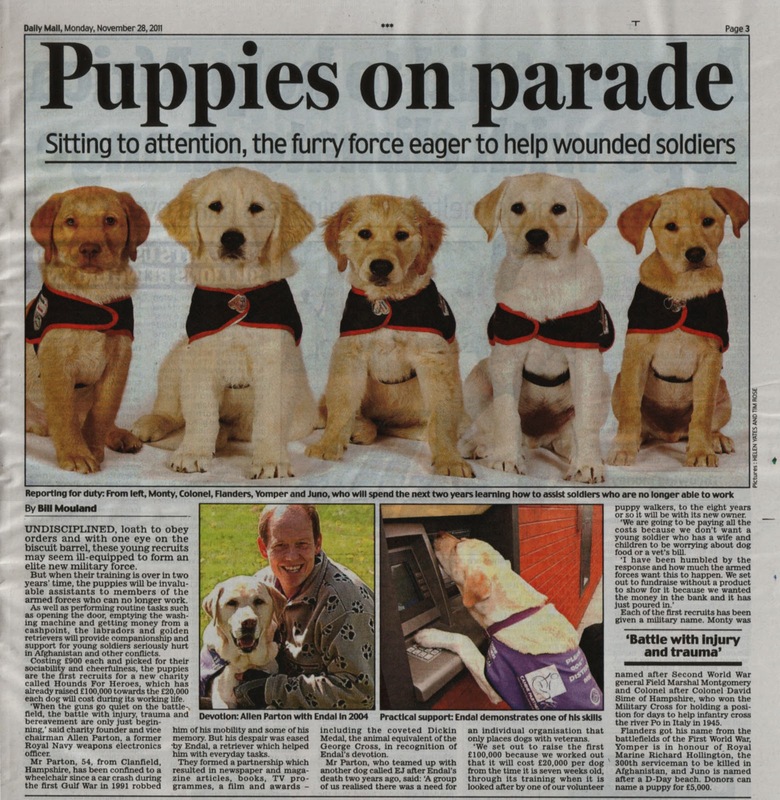 "Hounds for Heroes" is a fantastic charity and a brilliant idea. I met Allan and Endal many years ago and what an inspiration they were, I have now trained my own Spaniel to be helpful around the house as I have severe arthritis, he is not a registered assistance dog but he enjoys helping out.. I have supported this charity from the beginning and these puppies are the start of something massive, keep up the good work..